We think of allergies as being caused by a substance to which you are allergic. Some people are allergic to dust mites, pet dander, pollen, or all of these and other allergens. While it's true that for some people these particles lead to runny noses and watery eyes, those symptoms are signs of your immune system malfunctioning in the presence of harmless invaders. Allergic reactions aren't a sign that your immune system is failing you, but rather that your immune system is working a little too well. Your immune system identifies invaders in your body and works to kill them. This method is very useful when the invaders are viruses or harmful bacteria. Isolating and killing these intruders keeps you safe from infection and the common cold. But when your immune system misidentifies pollen particles or pet dander as a potentially dangerous substance, you just end up sneezing a lot for no good reason. How Do I Prevent Allergies? You definitely can't prevent allergies by using antihistamines that simply mask the symptoms while possibly causing other unpleasant side effects. When over-the-counter and prescription medications cease to work, many people opt for allergy shots. and while allergy shots can be somewhat effective for some people for environmental allergens such as pollens and dander, the American College of Allergy, Asthma, and Immunology has stated that not enough research has been done to support the use of shots for food or skin allergies. If you do decide to do allergy shots, you will need first to complete a skin test and then go through several rounds of immunotherapy shots that may take a few years to complete. After that, the shots may remain effective for a couple years. Masking the symptoms is like turning off a fire alarm while the house is on fire. You need to address the house fire, not just mute the alarm. turning off the alarm (or symptoms) is just tricking the immune system, which may lead to unintended consequences down the road. Instead of hiding the symptoms of your allergies, you might want to look at your overall health and your lifestyle. Protein is the fuel that your immune system runs on. The immune system needs to produce many protein-based molecules to fight off foreign elements in your body. If you aren't eating enough healthy, protein-rich foods, you may be protein-deficient, and your immune system may be running out of gas. At Essential Health Solutions, we can help you determine if your diet is lacking in healthy protein or any other nutrients you need to keep your immune system healthy. Allergies are on the rise in the US, particularly among children. In 1996, just 6% of Americans under 18 had allergies. In 2003, that number jumped to 9%. According to Dr. Marc Rothenberg, director of Allergy and Immunology at Cincinnati Children's Hospital, "it's not just that more kids have allergies," but that "the severity of those allergies has also increased." 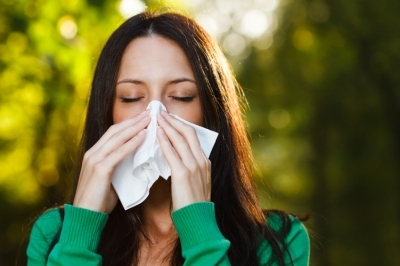 Why are allergies becoming more prevalent and more severe? Many experts speculate that the growing number of genetically modified organisms (GMOs) present in our food has something to do with it. In 1999, UK researchers at York laboratory found that reactions to soy-based foods had gone up by 50% in just one year. This increase is alarming when you consider that over 90% of the soy crops in the world have some form of genetic modification. Scientists and environmental health advocates have expressed their concern that the genetically altered components of GM foods can trigger allergies in people. A 1999 study on farm workers who had been exposed to bioengineered corn had increased rates of the classic allergic reactions, such as skin irritation, asthma, and runny noses. These farmers also had higher levels of allergy-related proteins in their blood. Unfortunately, the study was never repeated to determine if the allergies were from the GMO corn or another factor. Another test using mice found that GMO corn induced greater immune responses that did traditional corn. Dairy foods have long been suspected of exacerbating allergy symptoms. Even if dairy foods don't usually cause a reaction for you, they may make your allergy symptoms worse. A study done on formula-fed babies found that at three months, the infants "were secreting low levels of serum antibodies to bovine proteins contained in their formula ... most formula-fed infants developed symptoms of allergic rejection to cow milk proteins before one month of age." Over half of the babies in the study developed skin rashes or other skin irritations, about half developed digestive problems, and nearly one-third exhibited respiratory problems. We are familiar with similar reactions in adults. What Else Can I Do To Help My Allergies? Get a good HEPA filter air purifier for your bedroom to reduce allergen exposure during sleep. Make sure you keep your door closed while it is running. Try natural products like "D-Hist" or "D-Hist Jr." by Orthomolecular, or Vitamin C - a natural antihistamine. Antibiotics kill the "good" bacteria in your gut that help keep your immune system and entire body in balance. Get your vitamin D levels tested and if you aren't getting enough, consider a high quality vitamin D supplement. Low Vitamin D levels can cause increased sensitivity to allergens in children and adolescents. Vitamin D may also help you if you suffer from mold allergies. Eat foods rich in Omega-3 fatty acids, which have an anti-inflammatory effect. Nuts and seeds are good sources. The key to helping your immune system deal with allergies is nourishing it with a healthy diet. You can't truly know what your deficiencies are unless you have a thorough nutritional analysis. A consultation with a functional nutrition practitioner is the first step in getting objective, scientific analysis of you overall health and it's impact on your allergy symptoms. Don't guess about your health any longer! Call Essential Health Solutions today to set up a consultation 773.878.7330 or request and appointment on line. Your individual health status and any required health care treatments can only be properly addressed by a professional healthcare provider of your choice. Remember there is no adequate substitution for a personal consultation with your chosen healthcare provider. Therefore we encourage you to make your own health care decisions based upon your research and in partnership with a qualified health care professional.